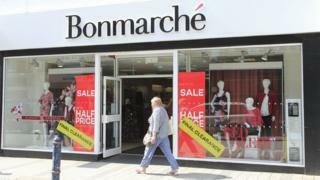 Shares in clothing chain Bonmarché are down 14% after it warned losses could reach £5-6m this year, far worse than the £4m loss previously predicted. But it said trading since the start of this month "significantly" weakened. The statement comes less than two weeks before the company's annual results at the end of March. But since then, trading in March had reversed those gains and "in light of this, we now believe there is a likelihood of sales levels for the remainder of the month continuing to follow this trend". It went on to say the underlying loss for the year to the end of March 2019 would be greater than £4m, and "accordingly, we now estimate that the underlying PBT [profit before tax] loss will be between £5m and £6m".